Marsh, James H. and Jocelyn Harvey. "Cultural Policy". The Canadian Encyclopedia, 12 October 2016, Historica Canada. https://www.thecanadianencyclopedia.ca/en/article/cultural-policy. Accessed 18 April 2019. At another level, culture is associated with communications and "mass culture" through broadcasting, film, book and magazine publishing, television, sound recording and new media, etc. Cultural policy in general refers to government measures taken to encourage or to protect activities in areas defined as cultural. Much of the confusion over the objectives of cultural policy derives from the term Culture itself, an omnibus word with distant origins in the Latin word culturao, referring to cultivation of the soil. At one level, culture refers primarily to artistic expression, and in this sense cultural policy is largely concerned with government funding and promotion of the arts (see Arts, Heritage and Cultural Industries Funding). All societies have recognized the power of art and most have honoured and supported artists. In the 20th century, governments came to fill the role played in previous times by the Church, by royalty or by wealthy patrons. At another level, culture is associated with Communications and "mass culture" through broadcasting, film, book and magazine publishing, television, sound recording and new media, etc. Cultural expression is more and more bound up with the development of cultural industries, which play a key role not only in disseminating works but in forming the way in which the culture itself is perceived. The idea of culture has an even broader usage, developed from philosophy but given its greatest currency in the social sciences. These definitions of culture encompass nothing less than "that complex whole which includes knowledge, belief, art, law, morals, custom and any other capabilities and habits acquired by man as a member of society" - or, in the words of UNESCO, "ways of living together." Viewed in this way, culture is seen as a public good and cultural policies emphasize the need to preserve or to invigorate cultural identity, or at least to create an environment in which a distinctive culture can emerge. Such policies are often developed as an antidote to external pressures. In the case of Canada, this pressure has traditionally come from the overwhelming presence of the United States. While there is no official definition of culture and no single overriding cultural policy in Canada, the many initiatives taken by Canadian governments to support culture contain elements of each of these definitions. Governments provide funding and other measures of support to the arts; they administer regulations and programs that assist the cultural industries; and, however diverse its manifestations, their underlying purpose is to create an environment in which Canadian creativity can flourish and Canadians can have access to the fruits of Canadian imagination, heritage and history. Even in a world awash in the cultural products of the United States, the cultural marketplace in Canada is uniquely unbalanced. Sharing a common language with the Americans and living within easy reach of the border, Canadians are avid consumers of foreign, mostly American, culture. The vast majority of books, films and records bought here is produced outside Canada for foreign markets. Most of the revenues from the sale of these products in Canada flow outside Canada rather than to Canadians, who might be inclined to help finance the development of Canadian talent. Foreign firms account for 46% of domestic book sales in Canada, 81% of the English-language consumer magazines on the newsstands, 84% of total revenues in the sound recording industry, and 98% of screen time in Canadian movie theatres. Canadian producers have limited access to their own market while foreign firms, with formidable advantages of scale and cost, profit greatly from their Canadian operations. Yet it is the Canadian-owned sector that is largely responsible for bringing Canadian works to Canadian audiences. Foreign firms distribute Canadian materials both domestically and abroad, especially once the creator or artist has achieved commercial success, but Canadian-owned producers are the principal suppliers of original Canadian works for the Canadian marketplace. As a democracy whose borders are open to the products of many lands, Canada's challenge has been creating conditions for the development of its own arts, heritage and cultural industries. Equally challenging today is the task of formulating cultural policies that will reflect the fundamental realities of the country - the co-existence of 2 official language communities (and the consequent segmentation and differentiation of the cultural market), a geography marked by vast distances that has bred powerful regional differences, a substantial Aboriginal population dispersed across the country and representing numerous cultural traditions and languages, the growing ethnic, racial and linguistic diversity of the Canadian people, and a constitution that gives no level of government unique or dominant responsibility for culture. These characteristics account for much of the distinctiveness and complexity of Canada and help shape its cultural policy. Whatever cultural policy becomes in the future - it is still unfinished business in this country - it is almost impossible to imagine it not grappling with these basic realities. The earliest form of government support for culture in Canada came in the 19th century with the tentative funding of archives, museums and art galleries that accompanied an awakening interest in the past. The archival tradition dates back to New France, although the National Archives of Canada was not formed until 1903. The National Museum of Canada, which later became the Canadian Museum of Nature, began with a grant of £1500 from Queen Victoria in 1841. These measures were an acknowledgment of the worth of preserving heritage through documents and cultural artifacts, but serious government involvement in the arts in Canada did not really begin until after WWII, as part of the general growth of state involvement in social life that accelerated after the Great Depression. The power of communications had been acknowledged in WWI as government attempted to control how the war was perceived through widespread censorship and propaganda. War Artists were hired to depict Canada's participation in the war, but it was the advent of radio in the 1920s that opened official eyes to the need for a domestic policy. In 1928, when Canadian radio technology was still rudimentary, American stations were beaming freely across an open border. As a result, the Royal Commission on Radio Broadcasting (Aird Commission) was struck. In its report (1929) it recommended a state-owned system capable of "fostering a national spirit and interpreting national citizenship." In turn, film, television and other technologies raised the same concerns. The lobbying of the Canadian Radio League (founded in 1930) had a major influence on the realization of the Aird Commission's recommendations and on the establishment of the publicly funded Canadian Broadcasting Corporation in 1936. Other voluntary groups emerged in the 1930s and 1940s. Among these, the Federation of Canadian Artists, an association of several arts groups whose leaders included the Toronto composer Sir Ernest MacMillan and Montreal architect Ernest Cormier, was among the first to call for active government support for the arts. The Turgeon Committee on Reconstruction and Re-establishment (report 1944) was lobbied by arts groups to set up a board to promote culture. These activities helped to create an awareness of cultural issues and an environment in which later developments could take place. The most comprehensive and influential document in the development of Canadian cultural policy was the report (1951) of the Royal Commission on National Development in The Arts, Letters and Sciences (Massey Commission). The report focused on the extreme vulnerability of Canada to American influences and drew attention to the American newspapers, books and magazines flooding across the border. Furthermore, the commission noted with embarrassment that whatever support there had been in Canada for the arts had come primarily from American foundations, with $7.3 million alone from the Carnegie Foundation and another $11.8 million from the Rockefeller Foundation. Canada had paid a heavy price for this easy dependence, stated the report, in loss of talent, the impoverishment of our universities, and "an uncritical acceptance of ideas and assumptions which are alien to our tradition." Among the concrete results of the Massey report was the founding of the National Library (1953) and subsequently the Canada Council (1957). But the report also eloquently raised fundamental questions about the meaning of Sovereignty, the role of government in fostering the creativity of its citizenry, and the peculiar problems created by the cultural barrage from the United States. Similar sentiments were expressed by the Royal Commission on Broadcasting (report 1957), which emphasized the "need for a broadcasting system to help establish a Canadian cultural identity, particularly in the face of American encroachments" (see Broadcasting, Radio and Television). The Royal Commission on Publications (report 1961) was convened to investigate a troubled magazine industry, which it stated is "a part of our national heritage, reflecting something else than our concern for the market place." The Royal Commission on Book Publishing (Ontario, 1972) recognized that "the cultural implications of book publishing far outweigh the economic implications to society." Further support came from the Special Senate Committee on Mass Media (1970), the Royal Commission on Newspapers (1981), and the report of the Federal Cultural Policy Review Committee (1982). The Task Force on the Status of the Artist led to federal legislation on the status of the artist and on professional relations between artists and producers in Canada (1992). The Task Force on the National Museums led to the abolition of the National Museums Corporation and established the 4 national museums as autonomous crown corporations in 1990 (see National Museums of Canada). A number of themes recur throughout these examinations. First among these is that Canadian culture must be fostered with public money and protected by government regulation. In fact, over time cultural expenditures did rise dramatically; in 1997-98, the total by all governments was almost $5.6 billion. The reports recognized that Canadian cultural industries are at a severe disadvantage because they lack the large market required for economies of scale, and because so much income from the distribution of cultural products is drained from the country. Secondly, most of these reports argued that cultural support should be given without political influence and that key cultural agencies should be at "arm's length" from the political process. Finally, there was an assumption in these investigations that cultural activity is of great significance to the character and value of our very way of life and to the survival of a distinctive Canadian society. Needless to say, these principles have been contested, and the measures taken to implement them have often created controversy, not the least of which have been disputes over Distribution of Powers. "Culture" was not specifically assigned under the terms of the BNA Act in 1867, except for Education, which was assigned to the provinces. In 1932 Québec and Ontario contested the federal government's right to control broadcasting. Federal jurisdiction was upheld in the courts, but other challenges have arisen as each new technology has made an impact. 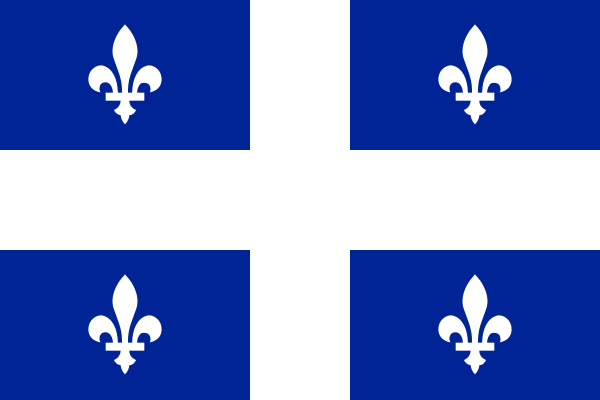 Québec has always interpreted provincial powers, particularly those referring to education, as including those necessary for the preservation of a French Canadian culture. With the efflorescence of Québec in the 1960s the issue of culture was increasingly politicized. Federal institutions, such as the Canada Council, National Film Board and CBC, were often seen as intruders in Québec, eroding indigenous culture. In the early 1970s, Gérard Pelletier, Secretary of State in the Trudeau government, introduced a policy of "democratization and decentralization" designed to respond to the divergent regional realities of Canada. Although the practical outcomes were largely limited to the creation of a national museums policy and scattered programs in the arts and heritage, Pelletier was the first (and some would argue, the only) federal minister to approach cultural policy with a unified concept. Québec Premier Jean Lesage created the province's Department of Cultural Affairs in 1961; it began with a budget of $3 million. 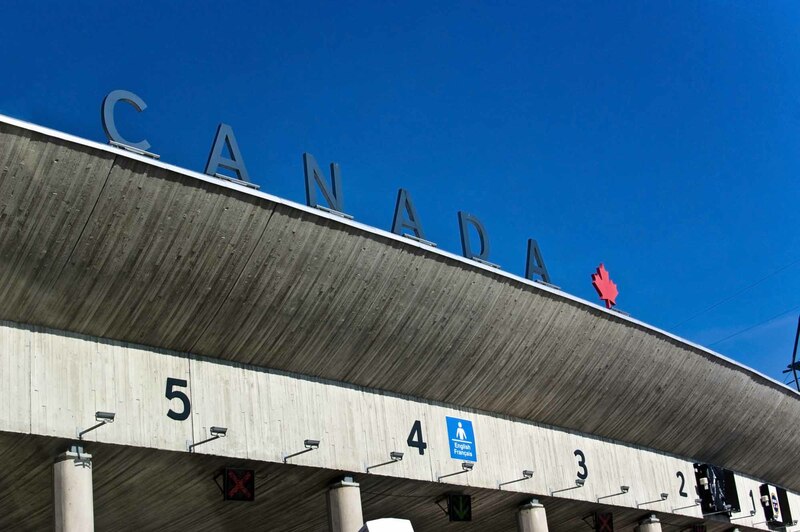 It became the Ministry of State for Cultural Development under the Parti Quebecois and its responsibilities grew to include language and immigration. The department is now known as the Ministry of Culture and Communications of Québec. Québec consistently expends more than any other province on culture. Of the nearly $1.6 billion spent on culture by all the provinces and territories in 1999-2000, Québec was responsible for over one-third ($652 million). By contrast, the next biggest spender, Ontario, lagged far behind at $380 million. Saskatchewan set up the first provincial arts council in Canada in 1948 and Alberta established a government branch responsible for culture in 1959, but the real explosion of provincial interest in culture followed, gathering momentum in the 1970s. In rapid succession, provinces established departments and councils with responsibility for culture - the Ontario Arts Council (1963), the Manitoba Arts Council (1965), the Manitoba department (1970), the Saskatchewan department (1972), departments in Nova Scotia and Newfoundland (1973), arts agencies in Prince Edward Island and British Columbia (1974), and departments in Ontario and New Brunswick (1975). All the provinces and territories now have a ministry responsible for culture, sometimes in affiliation with education, tourism, community development, or yet another field, and all provinces also have arts councils, which are mandated to provide grants and services to the arts. In the last year for which a breakdown is available (1997-98), the provincial and territorial governments allocated 40% of their cultural spending to libraries and 27% to heritage. For the most part Canadian municipalities came late to cultural support, but within the last decade they have become major players. In the 1990s, as the federal and provincial/territorial governments were cutting culture-related expenditures, the municipalities registered an increase of nearly 20%. 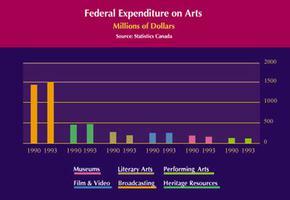 By 1997-98 they were collectively responsible for 27% of all government cultural spending in Canada. Libraries are their biggest beneficiary. At present, all 3 levels of government (4, where regional governments exist) are active in culture in Canada, and, given Canada's constitutional realities, none is subordinate to the other. Culture is a shared responsibility, and each level of government develops its own priorities and programs within its own policy framework and budgetary constraints. Typically, arts, heritage and cultural industries organizations find themselves dealing with 3 or 4 levels of government. Programs for the same sectors (sometimes with similar, sometimes with different, criteria and priorities) are often available from federal, provincial and local sources. For the cultural community, this "system" of cultural support, with its multiplicity of sources, has distinct advantages. It frees artists and cultural organizations from exclusive reliance on one perspective or point of view and provides better protection for freedom of expression than would a more "hierarchical" arrangement. Specific local and provincial needs can be recognized and addressed while the federal government pursues national goals and standards. At the same time, the Canadian "system" is inherently complex and diverse, with many decision- making centres and, beyond the general objectives of enhancing creativity and access, little singularity of purpose. It is subject to constitutional, regional and provincial political tensions arising from fields unrelated to culture. To work, the system depends on cooperation rather than dictation, and cooperation among the various orders of government is no easier to achieve in culture than in any other field. Canadian cultural policy in the 21st century is engaged with a number of international and domestic issues. The Free Trade Agreement between Canada and the United States came into effect in 1988 and in 1994 was transposed into the North American Free Trade Agreement with the inclusion of Mexico (see Free Trade). These agreements contain an "exemption" for cultural industries. However, they also incorporate a "notwithstanding clause," which allows one of the countries the right to assess the equivalent commercial impact of new measures in culture adopted by another and impose a countervail against any part of that country's economy. In practice, this could mean that the United States could respond to a new Canadian cultural initiative by imposing an economic penalty against another Canadian industry. Concerns that international trade agreements may deter Canadian cultural initiatives were heightened in 1997 as a result of the success of the US government's complaints to the World Trade Organization about a Canadian tax on revenues from magazines with an editorial content of less than 80% Canadian entering the Canadian marketplace and Canada's postal subsidies for magazines. The WTO rulings were a dramatic demonstration of how international trade agreements can constrain the actions of sovereign states intent on supporting and protecting their own cultures. Continuing to achieve Canada's cultural policy objectives within the globalized environment of international trade and corporate concentration has been a key goal of the Canadian government in the late 1990s and the 21st century. The government is actively pursuing the development of an international agreement that will recognize the importance of cultural diversity and enable countries to pursue polices that promote it. This "new international instrument," the particulars of which are as yet undefined, would seek to guarantee that cultural goods and services are treated differently from other types of products in international trade regimes. To this end, Canada initiated the International Network on Cultural Policy, a group of ministers of culture from around the world, in 1998. Approximately 44 nations have joined the network, which aims to put cultural sovereignty and cultural diversity at the top of the public agenda. To engage citizens' groups in this endeavour, the Canadian government has supported an emerging network of non-governmental organizations from around the world - the International Network on Cultural Diversity, led by the Canadian Conference of The Arts, Canada's major arts and cultural advocacy body. In 1995 the government of Canada officially identified culture as the third pillar of Canadian foreign policy (along with security and economic prosperity). The cultural community believes that this declaration has yet to be translated into tangible improvements in Canada's international cultural relations, which remain an underutilized instrument of cultural policy. The Department of Foreign Affairs and International Trade administers a grant program for Canadian groups and individuals promoting, marketing, exhibiting and touring outside Canada, and also offers guidance for cultural exporters entering the international market. In addition, Canadian missions abroad, particularly where there are officials charged with cultural responsibilities, work to promote Canadian culture. Canada has entered into a number of international cultural agreements, especially for film production. But Canadian cultural activity abroad is constrained by its low priority within Foreign Affairs. Joining these global issues are several domestic policy considerations. Perhaps the most important of these is the need to create conditions for the full participation in cultural life of culturally diverse and Aboriginal Canadians. At the federal level, this objective has been a strategic priority of the Canada Council since the early 1990s. Northrop Frye's prescient comment that "Canada must now preserve its identity by having many identities" is particularly appropriate to the goal of full inclusion. Second, after emphasizing the contribution culture makes to the Canadian economy during the 1980s and early 1990s, policy-makers have recently turned their attention to the social impact of culture - on children and young people, on neighbourhoods and communities, on the civility and safety of urban settings, on the ties that create common bonds among citizens. Research and studies are underway on the subject, and it is beginning to emerge as a theme in the policy frameworks of governments. Third, another prominent policy issue is the somewhat belated recognition of the value of the arts in early childhood learning, following the widespread reductions in spending on the arts in education that accompanied government cutbacks in the 1990s. Research on the impact of the arts on learning is underway within education and governments, but there has as yet been no upturn in spending. As education is a provincial responsibility, federal programs have only limited impact in this area. Fourth, while developments are incomplete, cultural policy is increasingly being treated from a multidisciplinary, holistic perspective. From the 1950s to the1970s, when cultural organizations were "professionalizing" in Canada, the emphasis in programs and policies was discipline- or sector- based. Now, however, cultural activities are being examined as part of a "continuum" - the full range of human activity in culture, from training and creation to production, dissemination, preservation, conservation and consumption. The cultural continuum is useful as a means of identifying the similarities and dissimilarities of cultural activities and judging where on the spectrum cultural policies and programs are weak or non-existent and where they are strong. As a unifying concept, the continuum has the added value of integrating the public (the audience or consumer) as a full participant in cultural processes. Finally, citizen participation in cultural life - what is sometimes called "the democratization of culture" - is a developing interest in Canada and in a number of other nations around the world. Intent on creating stronger and deeper relationships between cultural producers and the audience, bridging the divide between "the arts" and "the people," governments are increasingly emphasizing participation in culture as a prominent goal of their cultural policies. In particular, the cultivation of new, younger and more diverse arts audiences is a common objective among Canadian arts councils and culture departments in the 21st century, and on the ground, in the trenches, this goal is being actively pursued by many companies and groups in the arts, heritage and cultural industries. In rejecting the revolutionary traditions of the American and French revolutions as well as its own republican outbursts of the 1830s, and in the unique compromise of region and nation inherent in Confederation, Canada emerged from its colonial past with a distinctive political culture. Ironically, at a time when Canadians have the most confidence to make a virtue of their diversity, their cultural environment is rapidly becoming a fragment of the American "entertainment" market. The order-in-council through which the Massey Commission was formed stated that "it is in the national interest to give encouragement to institutions which express national feeling, promote common understanding and add to the variety and richness of Canadian life." The Communications Technology that has offered a great opportunity to achieve such goals has as often been used to subject Canadians to the myths, anxieties and values of a foreign society. The ultimate goal of cultural policy is the creation of conditions that will encourage all forms of creative expression. 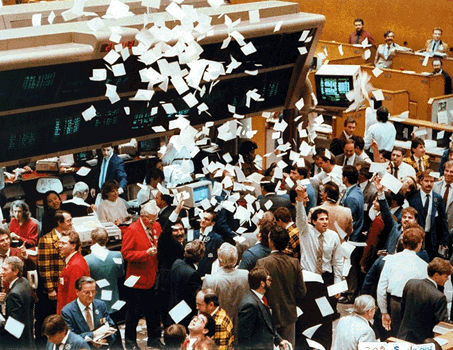 The values of the "free-market" economy - the profit seeking and competition for gain that most economists and business people claim should govern culture as much as any consumer product - are often anathema to art, which values challenge, risk, experiment and criticism. For those who believe that artistic expression is critically important to society and for those who acknowledge that the potential of communications technology lies beyond expanding the market for consumer goods, it is unacceptable to leave culture to a "free market" that is overwhelmingly dominated by foreign corporations. The disparities between the production, distribution and marketing capacities between the US and Canada would, in a "free market," quickly reduce the smaller nation to passive consumers. Any attempt to limit the flow of cultural products or ideas can appear to be narrow minded. But the purpose of cultural policy is to promote tolerance of all forms of artistic expression while ensuring that a creative community will have access to its own audience. Modern consumer society has brought a high material standard of living, but undoubtedly anxiety as well. The creative spirit, which probes the ethical and aesthetic meanings of life, is as crucial now as ever. In referring to our society's commitments to expend large sums of money on defence, the Massey Commission commented, "What, we may ask ourselves, are we defending? We are defending civilization, our share of it, our contribution to it. The things with which our inquiry deals are the elements which give civilization its character and its meaning. It would be paradoxical to defend something which we are unwilling to strengthen and enrich, and which we even would allow to decline." The words still stand. A defining feature of Canadian cultural support - characterizing the federal and all provincial governments - is the co-existence of government culture departments and arm's length arts councils. In addition to these entities, governments in Canada use a broad range of instruments to support culture. They include public institutions like archives, libraries, museums and arts centres; legislation such as copyright and status of the artist laws; direct financing in the form of grants, contributions and loans; financial incentives, including investment and tax credits; tax measures for charitable donations and the donation of cultural property; services such as those provided to the museum community by the Canadian Conservation Institute and to film producers by municipal film offices; Canadian ownership rules; Canadian content requirements; and international agreements. While public and media attention usually focuses on grants to the arts, indirect measures can have as great an impact as direct financing. Effective, modern copyright laws, for example, help ensure appropriate payment for intellectual property and therefore income for creators. The federal Department of Canadian Heritage is currently responsible for establishing overall policies on cultural issues of pan-Canadian importance. Created out of the former Department of Communications in a government reorganization in 1993, it has responsibility for policies and programs related to arts and heritage, broadcasting, cultural industries, Canadian identity, multiculturalism, official languages and sport. But some cultural responsibilities that were combined in DOC are now part of the mandate of the Department of Industry. Jurisdiction over copyright is divided between the 2 departments, and traditional broadcasting lies within the sphere of DOCH while telecommunications belongs to Industry. While DOCH is concerned with the cultural impact of international trade agreements, the lead department on that subject is the Department of Foreign Affairs and International Trade. As a result of divided mandates, the Heritage Minister can easily end up in conflict with other, more powerful departments. A great deal of Canada's cultural policy has been carried out by the federal cultural agencies, most of them created over the past 50 years, and many at arm's length from government. In 1936 the CBC began to provide Canada with a public broadcasting system, but the corporation has had a confused and sweeping mandate that it has struggled to fulfill, particularly on television. The 1991 revisions to the Broadcasting Act, which expanded the responsibilities of the CBC, were rapidly followed by government budget cuts that made fulfilment of those responsibilities especially difficult. The Canada Council is the central granting agency for the arts, but some politicians have had difficulty dealing with the independence that is essential to the Council's granting process. In Ottawa, the National Capital Commission was created in 1958 with a mandate to maintain a capital region in accordance with its national significance. The National Arts Centre, created by an Act of Parliament in 1966, was built to be a showcase of Canadian performance; it houses a resident orchestra and is one of Canada's largest co-producers of dance and theatre. In the fields of film, television and radio, Telefilm Canada, the National Film Board of Canada, and the CBC support Canadian productions. Also within the portfolio of the DOCH are the National Gallery of Canada, the Canadian Museum of Civilization (including the War Museum), the Canadian Museum of Nature, the National Museum of Science and Technology, the National Archives, and the National Library of Canada. Many of these agencies suffered budget cuts during the 1990s as a result of the government's program review and spending curbs. Most governments involved in cultural support provide direct financing, in the form of grants or contributions, to arts and cultural organizations and, in some cases, individual artists. Typically, funding for organizations involves partnerships: support comes from the federal, provincial and local governments, as well as earned revenues, donations and sponsorships. In fact, partnerships between public sources and private enterprise are characteristic of Canadian cultural support. Governments also directly fund the cultural industries, but their "toolbox" of measures for these entities also contains a variety of regulatory or structural instruments. These include loans, investment and tax credits, and Canadian content and ownership requirements. Canadian-content regulations somewhat limit the play of foreign programs on television. Canadian stations are permitted to substitute their own signals on Cable Television when showing the same program as an American station. The Canadian Radio-television and Telecommunications Commission issues licences and monitors performance to regulate the country's broadcasting system. To ensure that the system will carry Canadian products, it sets Canadian-content requirements. These rules apply to the radio and TV programming services that broadcast programs and to the distribution systems (cable television, direct-to-home satellite, and multipoint distribution systems) delivering broadcast services to homes. Radio and TV stations are required to devote a specific amount of airtime to Canadian content. In some cases, the CRTC also requires that minimum expenditures and/or numbers of hours per year be devoted to the broadcast of certain categories of Canadian programming such as drama, music, variety and children's programs. Beginning in 1989, conventional private broadcasters were required to show a specific number of hours of Canadian drama, music or variety programming each week during prime viewing time. Since 1971, Canadian-content regulations have also been applied to music played on radio. Currently, except for stations playing primarily instrumental music, the quota requires that at least 35% of popular music selections be Canadian. As technologies evolve, however, the applicability of regulatory measures may be reaching its limit. The CRTC has already decided against efforts to regulate the Internet. With the advent of cable and US television signals entering Canada in the 1970s, advertising revenue began to shift from Canadian stations across the border. To protect this source of income, amendments to the Income Tax Act made the cost of advertising with a Canadian broadcaster fully tax deductible while limiting the deduction for ads placed with US border stations. Similar legislation applies to advertising in newspapers and magazines. Like other governments, Canada imposes rules on foreign ownership in certain cultural sectors. Under the Investment Canada Act (1985), any foreign investment in a cultural industry is reviewed. In book publishing, new businesses are required to be Canadian-controlled, and the foreign acquisition of existing Canadian-controlled business is allowed only in extraordinary circumstances. In 1988 guidelines were developed for film distribution that prohibit foreign takeovers of Canadian-owned film distribution firms. While existing foreign distributors were "grandfathered" under the guidelines, there are certain limits placed on new foreign investors and foreign takeovers of foreign-owned firms. In 1996, given the growing convergence of telecommunications and broadcasting and Canadian broadcasters' need for capital, the federal government increased the maximum allowable foreign investment in a broadcasting company. Now up to 46.7% of such a company and 100% of its non-voting shares can be foreign-owned, providing that de facto control is not exercised by non-Canadians. This change brought the rules for broadcasting into closer accord with those applying to telecommunications. Canada Council for the ArtsThe website for the Canada Council for the Arts. Check out the many awards given annually to noteworthy Canadian performers and organizations in the arts. See also the "News Room" for the latest announcements. Canadian HeritageThe website for Canadian Heritage, the federal government department responsible for promoting culture, the arts, heritage, official languages, citizenship and participation, including multiculturalism, and Aboriginal, youth, and sport initiatives.